I’m not a fan of being scared. I had to hide behind the couch when the Six Million Dollar Man met up with Bigfoot. That said, I’ve learned to enjoy a bit of creepy tone in my dramatic tension. 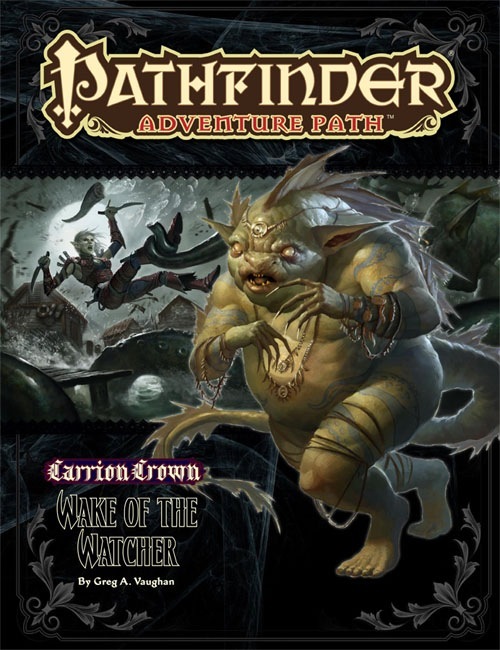 My most memorable creepy game was the Wake of the Watcher module from Paizo’s Carrion Crown adventure path that I had the pleasure of playing from the second module to the end. The Watcher module features creepy townspeople, a creepy cult, creepy monsters of the squishy, insanity provoking outsider types… fun stuff. That said, I was happy to move on from that adventure to something smelling less of dead fish. Or was that Oberon’s armor that smelled? This entry was posted in D&D, Gaming and tagged D&D, Gaming, Pathfinder, RPG, RPGaDAY on August 29, 2014 by Geoff. 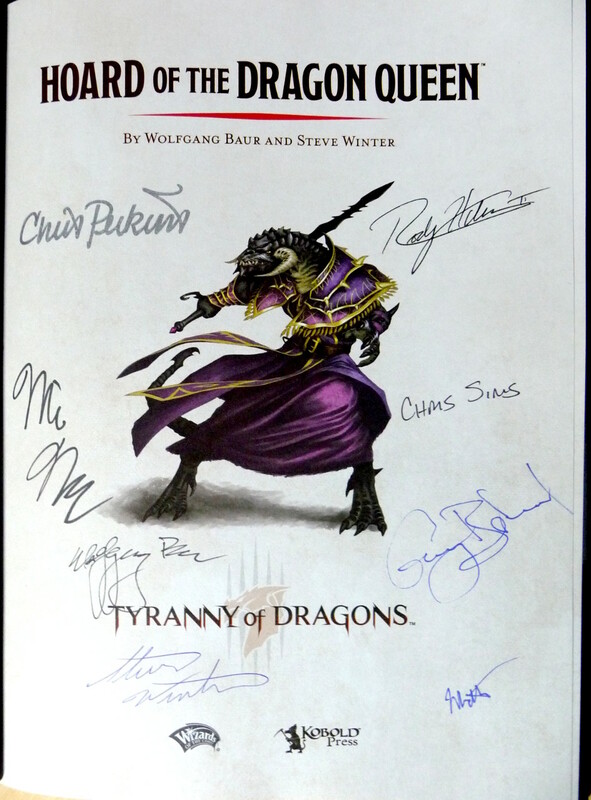 My autographed copy of Hoard of the Dragon Queen finally arrived! I’m waiting until I have time to read and savor it. But soon, my pretty, soon. This entry was posted in Gaming and tagged D&D, Gaming, RPG on August 28, 2014 by Geoff. I’m taking Autocratik’s RPGaDAY topics out of order. My favourite RPG that no one else wants to play was also one of my convention purchases, Blue Rose, designed by John Snead, Jeremy Crawford, Dawn Elliot, Steve Kenson and John Snead. Welcome to the world of Blue Rose, a fantastic reality where brave women and men, gifted with arcane powers, live and work side-by-side with intelligent animal companions. The heroes of the peaceful Kingdom of Aldis strive to uphold the ideals of fairness, justice, and equality, while protecting their homeland against its aggressive neighbors. From the free Blue Rose Fast Play Rules download. 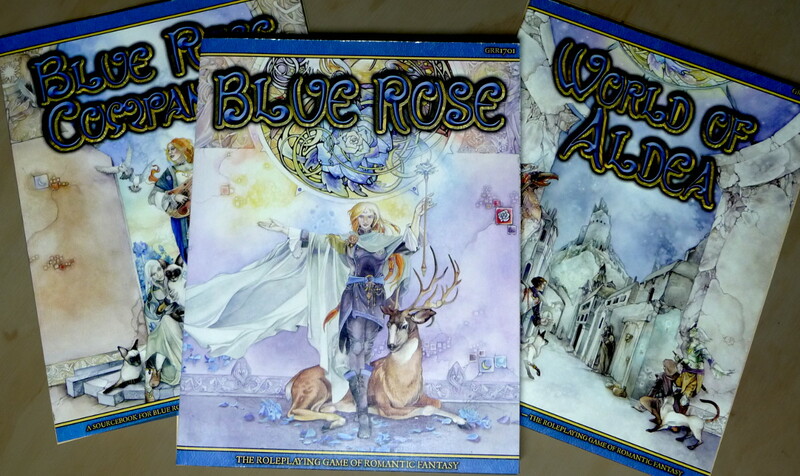 The Blue Rose RPG and two companion books. It was the first game to use what become the True20 system, based on the Open Game License from Wizards of the Coast; a sort of d20 light. But what really draws me to the game is the setting. If you aren’t familiar with the genre of Romantic Fantasy, John Snead offers some good background. I was drawn in by the artwork and opening fiction, and then started reading the novels cited in the inspired by sidebar; series like Mercedes Lackey’s Heralds of Valdemar and Vows and Honor. These stories feature societies of high ideals, and heroes who work as part of a larger effort, against aggressors without and corruption within. They feature magic, psychic abilities, intelligent animals, and romantic connections among characters. Some criticize the heavy hand with which liberal social ideals are venerated. I heard them called “wish fulfillment rather than fantasy.” But to me, there’s something powerful about the emotional weight of the stories, with their emphasis on connectedness and hope, honor and sacrifice. I’m not sure d20 is particularly suited to this kind of storytelling. The game does implement a light and dark nature attribute for characters, as well as a corruption mechanic for those who dabble in foul sorcery. But I have yet to actually play it. I still cling to the hope that someday, I’ll find a group of fellow romantics who will indulge me. This entry was posted in Gaming and tagged Gaming, RPG, RPGaDAY on August 28, 2014 by Geoff. Thanks to Autocratik for this series of RPG discussion prompts. And to my friend Tyler for his inspiring responses on his blog, Held Action. And for prodding me into reviving my own blog. 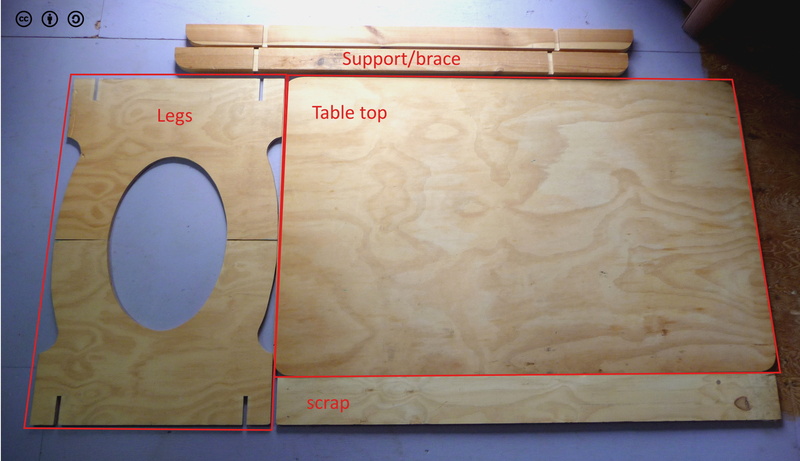 I’m going off-script today with my own topic: build your own game table. It isn’t often that I get to talk about gaming and woodworking in the same breath. I made this table because I needed a big surface that was lower than a normal table, but a higher than a coffee table. I also needed something inexpensive. Here’s my solution. This table can easily be knocked down and stored when not in use. It’s built from one 4×8 foot sheet of plywood and a couple 2x4s. I built this to be comfortable for folks sitting on a couch or easy chair. You can adjust the dimensions to suit your needs. Legs and table top cut from single sheet of plywood. I picked a sheet of plywood with a good side and a patched side. I had the home center make the cut to separate the legs from the table top, and then had them cut the top to width. The rest of the cuts I made with a jigsaw. Two-by-fours fit into vertical notch in legs. 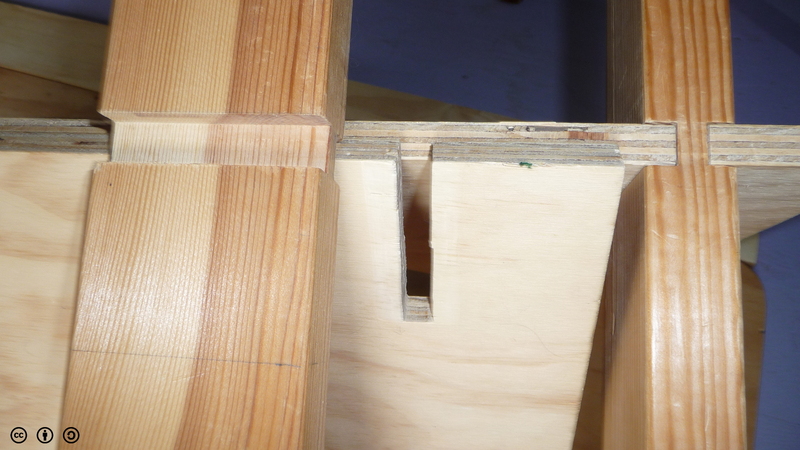 I used a simple edge-lap joint; grooves on each side of the 2×4 that lock into a vertical notch in the plywood leg piece. The legs and braces assembled. Here are the legs and braces assembled. It’s surprisingly sturdy. Table height was select to work well from low chairs or couch. 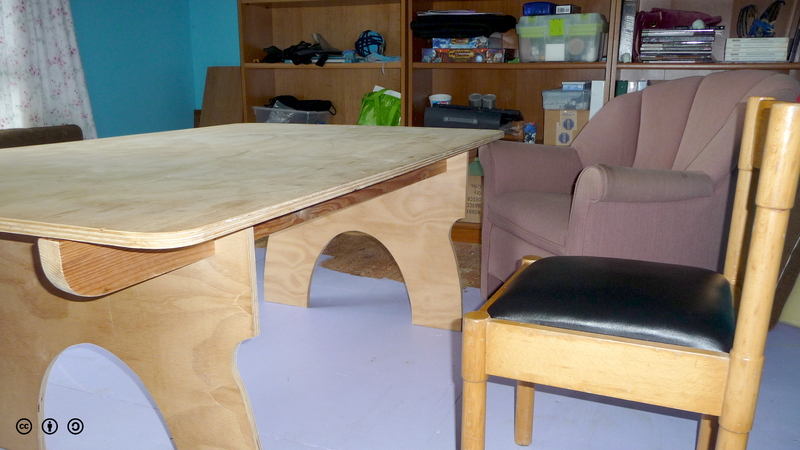 This photo shows the height of my table, which is 24″ (half the width of the plywood). It’s low enough that people in easy chairs or on a sofa can see the table easily. 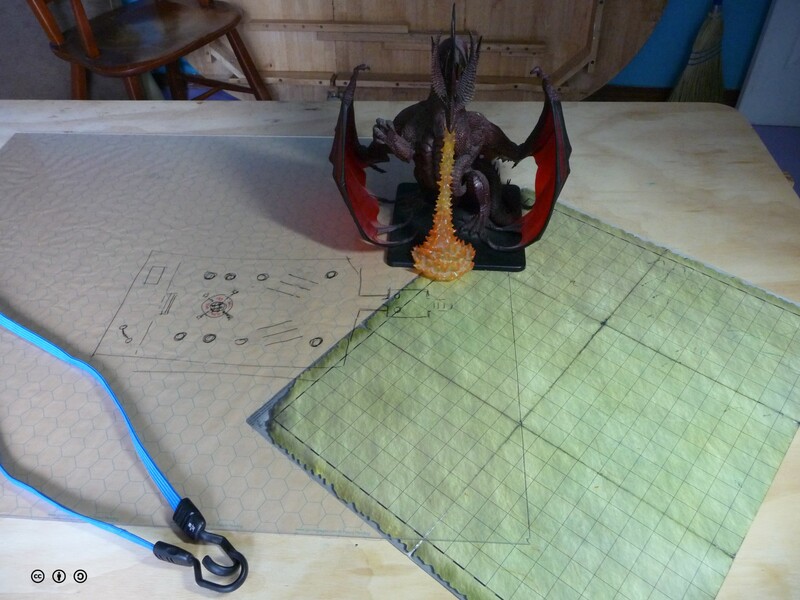 Some useful accessories: elastic tie downs, acrylic sheet or gaming mat. I used some elastic tie downs to keep the table top from sliding around too much. More recently, I picked up a sheet of acrylic, under which I can place maps or grid paper. I have a preference for wet-erase markers, and they work nicely on the acrylic. I also picked up a couple large pieces of craft felt to cover the table, which was a nice surface until the cats got to it. I didn’t put any finish on the table, but I’m considering adding some paint (to cover the food stains). 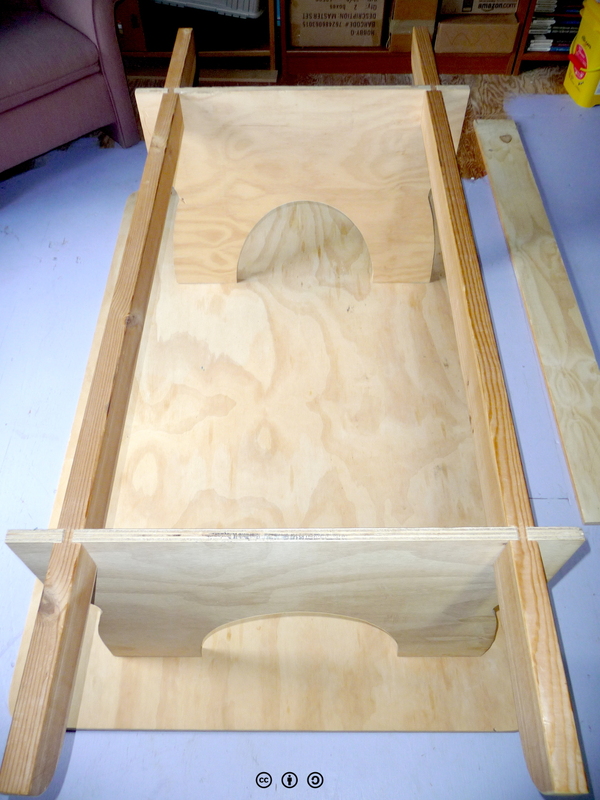 This entry was posted in Gaming, Making, Uncategorized and tagged Gaming, Making, RPGaDAY, woodworking on August 27, 2014 by Geoff. Thanks to Autocratik for this series of prompts. And to my friend Tyler for his inspiring responses on his blog, Held Action. And for prodding me into reviving my own blog. My pick for coolest character sheet is Mouse Guard. The sheet has all the information a player needs for playing the game. On one side is the important character and roleplaying information, and on the other is reference information about the conflict resolution system. The sheets are well organized and attractive, as well as very functional. The sheet is available as a download, along with pregen sheets filled out for the main characters from the Mouse Guard books. This entry was posted in Gaming, Uncategorized and tagged Gaming, RPGaDAY on August 27, 2014 by Geoff. Well, with HD. We moved into a new house over a year ago, and we opted not to get a cable TV subscription. 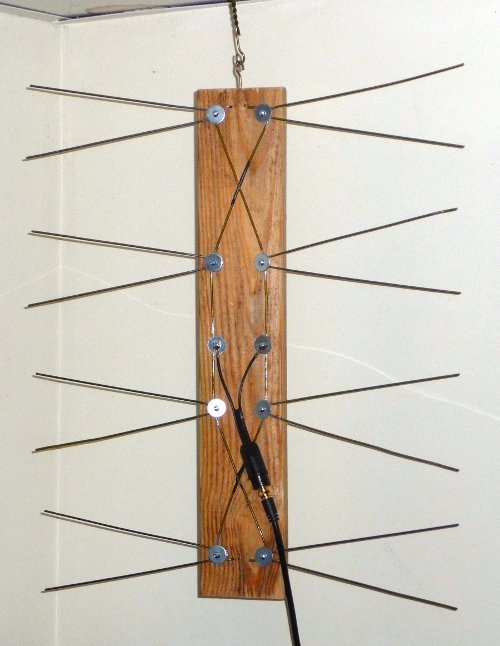 But the HD antenna I got at the Shack wasn’t pulling in strong signal. Which is sad, because I almost have line of sight to the antennas on top of Mount Mansfield. 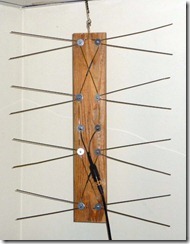 I decided to build one of the DIY antennas, following the instructions Make magazine has online. I skipped the stand, and just hung the antenna. I even got to use my new Dremel tool to strip the coating off the coat hangers. So far, it seems to be working much better than the retail one. This entry was posted in Making and tagged Making, projects on February 14, 2012 by Geoff. This entry was posted in Fun and tagged Fun, Music, video on December 30, 2010 by Geoff.